– You can set Home and Work favorites and their arrival ETA will show up on Waze live tile. – Fixed a bug for honoring back button from the main screen. – Due to some voodoo cibyl does, the network session variable was nullified in unexpected places. Splitting the function that consumes it solved the problem (at least for now). – Added ‘save logs’. Whenever you see a problem, click on this menu item and the logs will be sent to my dropbox. Version 0.9.9.5 (5/5/2012) – Missing Tiles / Search problems are over? – As a result of the fix, map movement is much more reliable. No more map getting all blank when you swipe your finger fast. You can now really follow the proposed track with moving the map across the path. – Better HTTP handling. You should expect better tiles management. – After several frustrating weeks I finally succeed in repro’ing the map being stuck bug. The reason it was so hard to find is the scenario where waze wants to display a bitmap but due to some reason the image size is 0. This leads to endless loop while trying to see what text size should fit into such bitmap. – Fixed the appbar issues – the appbar will be always visible now. – AppBar blocks the navigation bar (street name, eta etc.) – the appbar will be minimized again until we solve this issue. – Clicking on Alternate Routes in portrait mode did not do anything (problem was that it expected the finger to click 40 pixels below) – fixed. – Fixed Race condition in language loading that cause Waze to crash during load. – Pressing Back button takes the car back to focus on map (and then shows the confirmation message). This is good if you want a button that will always bring you back to same state, no matter where you are in the app. Eli Ofek has done it again and redesigned the reporting screen with easy to use icons for your convenience. – You wanted Exit to be fast – you got it. – Pressing Back button on main screen exists Waze (w/ Confirmation). Eli Ofek keeps contributing great stuff. This time, helping feature for you who love to hear music/audio books while navigating. Waze will no longer stop you currently playing music but rather play the directions in a louder volume. Eli Ofek doesn’t seem to stop surprising us and enhanced the When-To-Go-Home feature to include Work ETA too. 1. You now have dedicated screen for configuring the live tile settings. From this screen you can also email crash log to help us stabilize this feature. 2. The number in circle is Max(ETA Home, ETA Work) so on the mornings it will show ETA to Work and from afternoon will provide ETA to Home. “When to go home” feature was added by Eli Ofek and me. You now have live tile updating at the frequency you choose to update you about the time it will take you to drive home. 1. At the settings screen, go to Other screen and there you will find Live tile settings. Enable it and set its update frequency. Welcome XNA: converted all graphic drawing to XNA. HUGE performance improvement – smooth map movement at all zoom levels. Finally a version that gives proper fight to iPhone/Android versions. – App crash stack traces will be mailed to me. – Added native screens for Favorites, Recent searches, Saved Locations, Map Settings and Car choosing. Long click on items in each of the screen brings up context menu with the relevant options. – Search screen now has shortcuts for Favorites, Recent Searches and Saved Locations. – No more ‘Waze needs to be restarted due to infra changes’ message. – Messages are now aligned according to the language. 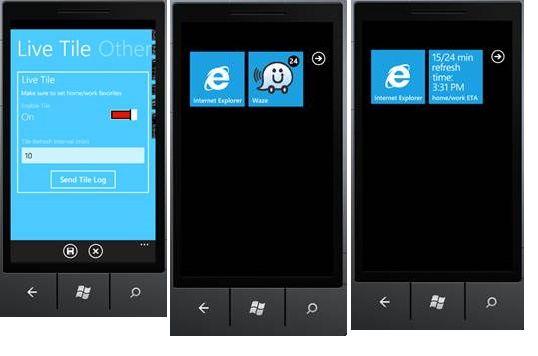 – Logon, Sign-in, Sign-up, Search and Search Results dialogs are now being drawn using WP7 controls. This means you should expect great experience when using them. – Changed GPS to pull mode – no more “No GPS reception” when you are waiting for the green light. – App Bar is now visible on Waze startup and will stay opened while browsing through the menu items. – Messages are now right aligned. – Brought back WAV files instead of WMA – the media player handle compressed sound file too slowly. Sorry folks, the package is getting back to be 8MB. – Reporting now works again – had some regression. – Changed the fav icon in the app bar to start Favorites and not Saved Locations. – Removed the Nbidi transformation, as SL4 supports RTL, no need to convert the strings any more. – Changed the AppBar to be hidden by default, to utilize the screen better while driving. Touching the bottom 60 pixels (approximately under the ETA bar) will pop the appbar back for 15 seconds or until a selection is made, whichever comes first. – The previous item exposes new text line at the bottom of the screen that is used to directing the driver to where the next turn should be. – Network now supports max 6 concurrent connections per host, and since then no more “Operation Failed” errors. – Removed redundant lock statments to increase speed. – Added support for Landscape mode. Rotating the device causes the map to rotate too. – Converted WAV files to WMA in order to decrease package size. XAP file is now only 4MB (thanks Eran Yariv for the tip). Note: that the sporadic “oops” failure during Search won’t stop by the new version. it’s not a client problem, it’s a server problem. it happens on WM6.5 & Android versions too the last few weeks. We believe it’s load related, as it happens mainly when you try to calculate routes during rush hours. – With courtesy of Meni Zalzman, converted queue implementation to real queue + changed ‘equals’ override from Java style to C# so that items will be actually checked for containment. This should result in better performance. – Changed the Exit icon on the app bar to Favorites as it’s more common action. Exit is still available on the ellipsis (…) menu. – Changed HTTP error handling to be more robust. This, along with the queue fixes should get Waze more reliable and less ‘Operation Failed’ kind of app. – Fixed Realtime alerts menu. Now it will show all alerts from all categories. – Increased pre-fetching to contain more tiles around the current point. – Copying sound files from resource to isolatedStroage on demand. This should improve startup times and reliability. – Text should be more aligned now. Look at the settings menus. – Clicking on report now offers you ‘Me On Map’ as one of the options in case you accidentally pressed it and want to go back to map. – Added Tile Cache for last 500 tiles (tile == vector data describing area in the map). Whenever Waze downloads a tile from the web it will now keep it on isolated storage so next time you need it will load instantly. The cache is managed in Fifo way so only the last 500 tiles will be kept. – Added pre-cached tiles for Tel-Aviv till Hod-Hashron. From the menu choose ‘טען מפה’ – (one item before Exit option). This will load the cache with tiles of the area starting from Tel Aviv till Hod Hasharon. – Reliability fix – catching NotSupportedOperation coming from Web requests. – REPORTING WORKS! Now you can be good citizen and help Waze get more up-to-date data by posting alerts (on the menu, click ‘דווח’). – Enhanced reliability – startup crashes are history. – Back button regression resolved. Pressing Back will return to map. – Clicking OK on ‘please wait’ dialogs was sometimes crashing – fixed. – Fixed mumbling at the end of many wav files. – Fixed timing issues with playing sounds to be more compatible with slower devices (and ones with Mango). – When entering username/password/address – the Enter key in the on-screen keyboard is now connected to the OK button. – The splash screen at startup no longer shows garbage at the bottom. – Decent performance, finally. Zlib operations were done against IsolatedStorage temp files, one byte at a time. Now all is done in memory – huge performance gain. Fixed map scrolling (at last). Now you can drag the map over and over again without need to pin your last position before next dragging. Sounds are now more reliable – Waze makes extra care of delivering them even if the application crashed during init phase. Perception is everything: on logon screen you get ‘please wait’ message after clicking on every button so at least you will have feedback that the touch was received and being processed. – (As you can see from the title) Added version number. From now on you will able to know what version is the latest vs. the one you have. From the menu choose ‘About’ to see your current version. – Hebrew support – finally you can use Native Keyboard to search address in hebrew. – Application and tile icons – it’s about time. – Increased street cached for better performance. – No more language downloads. – Replaced general menu icon with Waze icon. – Made audio directions smoother – no more lagging. – Back button now returns to map instead of bailing out the app. – Removed ‘Shortcuts’ menu item. – Added ‘Save’ button for ‘Data Usage’ menu. – Added ‘Save’ button to General Settings and Navigation Settings page. – Fixed ‘Save’ button location in ‘Map Settings’ page. – Map browsing is much faster. Also, no more double clicks and other voodoo for entering user creds. – Dialogs text are finally aligned. No more descriptions, ETAs and Speed coming out of their borders. – In ‘Add to Favorites’ dialog, the ‘Save’ and ‘Cancel’ buttons are now visible. Very cool that you keep squizzing juice from this sucker. Wonderful – I’ve been waiting months for some useful nav app for WP7 in Israel! I can’t believe this actually works! I tried it in Israel and it worked! Thank you so much, please continue with this project. Good work!!!!!!! Thanks a lot!!! Finally we have it here in Israel!! No .xap in latest zip file. I’m guessing I need an unlocked (chevron’d?) phone to install??? I fixed that. The zip now contains XAP. You’ll need to have unlocked device for installing it. thanks! keep up the good work!! chervronwp7 out of tokens for now… doh. IS there any way to put this on a normal, non-developer phone? Hi, how do you render your map and overlay your map? What areas of the original waze source code did you find this information? The idea behind this project is that Waze code will be converted from C to .NET on-demand. check out https://meirtsvi.wordpress.com/2011/05/17/waze-for-wp7-the-journey-begins/ for more info. What do you think of the likelihood of truly replacing the system calls and UI calls as microsoft has them mapped out for converting iOS to WP7? I am considering starting it, but to be honest, do not have much WP7 platform experience (though I do have iOS experience). But, given your work, if you think the effort is futile then I may just scrap it. But seriously, given the amount of good work you have done here, what are your honest thoughts? I think the main problem with porting the iOS version is that you need to keep porting every single change that is being committed to the iOS after you finished your initial conversion project. The advantage in automatic tool like I used is that you can take the latest code whenever you want and convert it on demand. The downside with my approach is that debugging what used to be the C code and now the .NET assembly requires you to put roadmap_log calls rather than simply put the debugger on the required line. Moreover, I didn’t understand the master plan. iOS/Android are C code – even with the guide you need to go line by line and convert it. This can take very very long time considering the vast usage of pointers. If you mean that you prefer to use the iOS code as input to cibyl I would suggest you try to search&replace all “#IFDEF IPHONE” and “#IFDEF TOUCH_SCREEN” occurrences in the code with “#IFDEF 1” and see where it gets you. After all the blackberry code i’m using contains the iPhone code to just masked by IFDEFs. Finally, every conversion cannot look good by automatic tools since every platform is different. In WP7 we have the back button while in iOS you must include graphic button for that in each and every screen. It doesn’t look good. We have Eran Gonen working on replacing all the configuration screens to native WP7 ones soon so the app will much better. As for other graphic issues, it might be better looking if we convert it from Silverlight to XNA since XNA have antialiasing feature while SL doesn’t (till now at least). This project still intrigues me. I just downloaded the Waze source from the Waze website for Android and iOS. Microsoft just came out with their API for porting from one platform to another: http://create.msdn.com/en-US/education/basics/porting … I don’t have a lot of WP7 experience, but I do have some iOS experience. Do you have any ideas about the ramifications of porting iOS using the MS tools for the API conversioin? Or any opinions on anything like that at all? You have done an amazing progress with the application since you moved to XNA. And now Ver 3.0 …..
you need to unlock the device before being able to install the app. Once you do that, simply install the WP SDK and use the application deployment utility in order to install the XAP file to your device. Yes!! Finally I can hear music with Waze 🙂 Thanks! Does it happen constantly or only sometimes? Its looking better everytime i hit your site, why dont you submit the app to MS so we can update via marketplace instead of XAP? Y not? can we get a permission from Waze? I have a developer account, I can publish that app to the market for free. Microsoft app store does not allow publishing application written in open source code with GPL license. Waze if GPLv2. I disagree and had a long discussion with the Win8 marketplace about this. The GPLv1 doesn’t mandate binary only distribution while GPLv2 does. So this code, being .NET isn’t actually a binary by the letter of the GPL law. MS may have a problem with GPL, but GPLv2 won’t prohibit a .NET App distribution since .NET isn’t a binary….. Unless Meir thinks otherwise, as far as I care, you are welcome to try and publish it. keep in mind that I am not sure it will be legal and there is more work required, like rebranding the name as Waze is a trademark probably… and with the current code I am not sure we will pass certification, I guess it will require some workdays to make it clean enough to pass the tests… we did not invest the time so far because we could not get an official answer if publishing the app will be legal. I am not a law guy, so I am not sure I fully understand your explanation, but to my best understanding the xap file is considered binary.. The way I understand it is that the XAP file is solely a transport mechanism, not an executable binary. The GPLv2 addresses only to distributing things in say, an old style EXE or compiled executable, not in temporary transport containers for the distribution itself. Where it comes down to is the legal definition of binary distribution. MY claim is that the code, being used for a .NET framework rather on W8 or WP7/WP8 only compiles down the code run by the framework and will install and sit on the machine or phone in code that is to be interpretted by the framework rather than executable code. Because of this, anything made for .NET is, for better or worse, not binary code. It is an intermediate step that you can run any tool to see the source code from, and therefore, the GPLv2 doesn’t apply as the “source” is distributed by the nature of it. Re-branding would definitely need to occur though. I see your point, but I am not sure how it will stand legally, the process of creating this xap/MSIL is called “Compilation” csc.exe is a compiler :-). Now I am not the one who you need to convince, it’s the legal people in MS who decide what is OK in the store and what is not 😉 I will be happy to see it in the store for sure! what about keeping the navigation in the background ?! is it Waze or wp7.5?! 1. Set the default audio device: Bluetooth or Speakers. 2. If the next route’ step is less the 200 meters, please notify it before the step. like: “turn right and then…..”. Will it be too much to ask you to zip it instead of rarring it? If its zipped we can install it using the browser. Thanks. nm, its a confused it with another homebrew site (some xda application that was rarred, somehow remembered it was yours). Thank you very much for your work Meir, you’re really filling a huge gap for us Israeli users. I hate waiting for the application to calculate the route just so I can cancel it and look for another/don’t look at all. Overall the application has become much more usable and reliable over the last couple of updates (still freezes here and there), thank you for your work! From the menu (clicking on the … symbol) choose stop navigation. Thanks for reviving the ‘Resume Navigation’ dialog window! Is the project still going? I guess it may become irrelevant now that Apollo is so close. I don’t currently invest any cycles on this one. It’s stable enough. I hope Waze will have something ready when Apollo is out. I tried to sign up, but the application tells me that “Username is empty”, but i filled that field! Never heard of this one yet. Use ‘Skip’ button if you are unable to get pass this screen. Waze has been revoked by Microsoft. Please uninstall it. 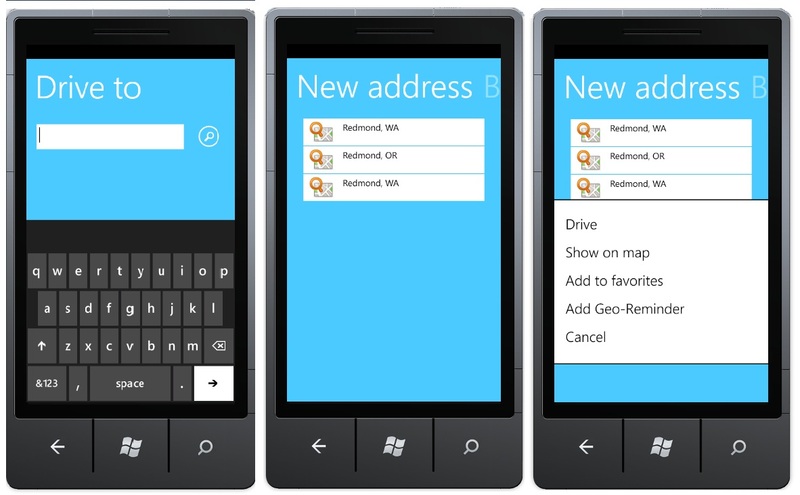 Getting ready for Waze on WP8 perhaps? I don’t get this message. It means your developer license is about to expire / expired. You will have to renew the license in order to keep using Waze. If you used ChevronWP7 to unlock your phone to run Waze then that’ll be the problem. Chevron apparently announced that they were closing down the service and all their unlock tokens would cease to be valid after the next time you sync Zune after 11-Aug-2012. I don’t recall ever receiving a notification. Yes, you were right – My dev account expired. I had to renew my license and reregister the phone. Thanks for the info! I heard Waze are currently working on that. It’s not open source anymore. Great, thanks for the info. Any intel as to how close they are? Meir, any way to install it on my Lumia 920? Any tips on how to set it on a Lumia 920? Do I need it developer unlocked? Big thanks to Meir Tsvi. Yes you’ll need to have it unlocked. you will need to dev unlock the device. Then use the WP sdk deploy tool to install the XAP file. Now I find the 9$ developer account handy 🙂 I’ll get to it tomorrow. Thanks! Got it. I hope this’ll sort me out until Waze actually releases something. Do you have any plans to improve it or did you just want to make it work on WP8? is there any reason to replace currently installed version Version 0.9.9.6 (27/6/2012) with new one Version 0.9.9.7 (06/02/2013) ? I am on WP7 Omnia, will it have any benefit ? No – there only changes I made is for the app to run on WP8 devices. Hi, I have a problem with dialogs.The text is displayed outside the dialog boxes. And there is also problem with overlapping different layers.. Screens with examples: http://sdrv.ms/ZExrdV http://sdrv.ms/YwtNvF . My phone is HTC Titan with WP7.8 inside. I have tested it on Nokia Lumia 800 to and with the same result.. These are known issues. The way I implemented XNA support greatly affects the order of the lines, text and icons. This sometimes leads to quirks as in your snapshots but changing it to proper ordering will require a lot of work. I guess Waze will do better rendering job with their version of WP8. If I understand it well, you already know some informations about development of an official Waze for WP8 platform? They say something about releasing a version during 2013 in their forum. How can i install was on nokia lumia 920? how can i install waze on nokia lumia 920? Get a dev license, install WP8 SDK and install the latest XAP file form the downloads page. Can you please let me know do I get the device license and the SDK? Other than wait for Waze to release official free of charge version you don’t have any other legal options. I seem to have read somewhere that you can copy the xap file to an SD card and then install an app from the SD card to the phone? Is this not the case? Not sure this method will work if you don’t have dev license. In This case, the xap is not signed, so I am almost sure it won’t work if the device is not developer unlocked. Patrick, you can still side load to Lumia, using a USB connection. Eli or Meir, do you have any details for getting a WP8 to dev unlock. I’m meaning to port a WinRT App I wrote to my phone anyway, I have directions for the old wp7, but not sure if the wp8 is the same. Why can’t you just release the App to the store. You need dev license and WP8 SDK installed. Once you have them, use Application Deployment tool to install the XAP from my downloads page. You need dev license for that. Once you have it, install WP8 SDK and use the application deployment utility to install the XAP inside the ZIP file. The problem is that the DEV license cost $99, I wish there was a cheaper solution. I found a free solution and uploaded Waze to my Windows phone. it’s not Installer on samsung ativ s. why?? You need Windows Phone dev license in order to install the XAP. Once you have one, install WP SDK and use the APP Deployment tool to install the XAP to your device. Hi Meir, I’m not a developer but I would love to have Waze on my Lumia 900 (WindowsPhone 7.8). Could you please explain to me how I can download and install the latest version? I have windows phone 7.8 installed on a Samsung Focus. I managed to install de xap file but I can’t get this working on my device. I can log in, but them i just see a blue car in a black screen. i can see alerts…but if i try to calculate route i get an error: Routing Service Timed out. Can you please help ? Install build 0.9.6 – this is the last build that supports windows phone 7.X. Make sure you have connectivity. Other than that, I’m afraid it’s probably server issues.